To feel happy you might choose to think or write about feeling happy. One way to ensure that you get into this frame of mind daily is to keep a gratitude journal – somewhere you write about what you are thankful and grateful for. This could be a book, a piece of paper or a journal on the computer – it’s up to you. Professor Richard Wiseman (author of :59 seconds) talks about the concept of ‘getting used to happiness’ by comparing it to going into a room smelling of fresh bread, which after a while disappears i.e. you get used to it. By channeling your thoughts into what you are grateful for rather than what you’ve done that day could make all the difference to your overall level of happiness. He writes about the research that’s been carried out on the psychology of gratitude and in one piece of research explains that those who wrote about what they were ‘grateful’ for every day were so much happier than the group who wrote about what ‘annoyed’ them and the group that wrote about the ‘events’ that happened to them. 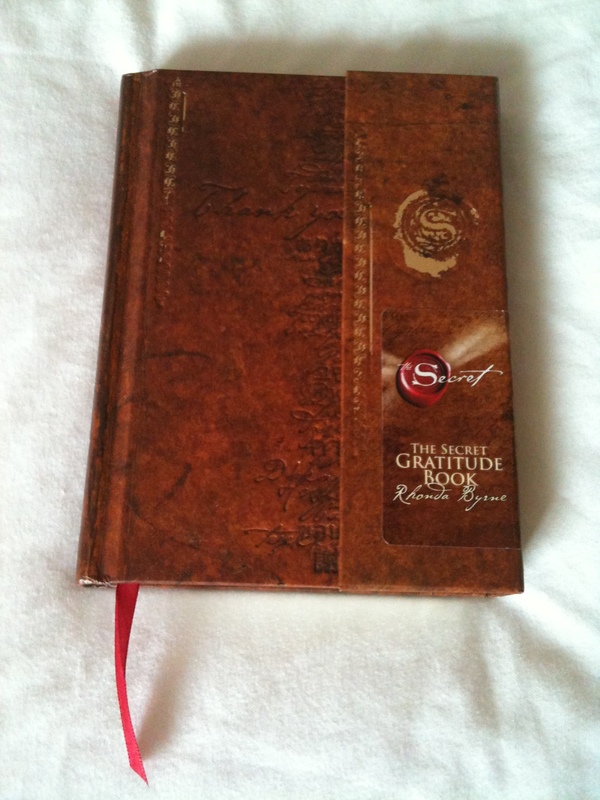 The concept of gratitude journals is nothing new – I just found one in my drawer that I bought after reading the book and watching the DVD ‘The Secret’ by Rhonda Byrne back in April 2009 (see image above). I’m ashamed and actually quite shocked to say that the last entry in the journal was August 2009! So, why did I stop? I think it just ended up going to the bottom of my bedside drawer and whenever I thought about writing in it, I either didn’t have a pen or it was too late in the day! “One of the most common happiness recommendations is to keep a gratitude journal. Studies show that doing so raises people’s life satisfaction, improves health, increases energy, reduces troublesome thoughts, and promotes good sleep” says Gretchen Rubin, author of the happiness-project (happiness-project.com). I love her suggestion that gratitude journals should remind you to feel happy about the problems that aren’t there. Great idea! My thoughts: It doesn’t take long each day to pen down a few thoughts about what you are grateful for. I might start this up again. As Professor Richard Wiseman says, if you choose certain types of writing for impacting your happiness e.g. grattitude writing or affectionate writing then, “a pen, a piece of paper and a few moments of your time” is all you need. « Note 342 – Can writing promote everyday happiness? I use to do this every night before I went to sleep, but I haven’t done it or about a year.